(Nanowerk News) Ten-qubit hyper-entangled Schrödinger cat state was successfully generated recently by a research group from the Quantum Physics and Quantum Information (QPQI) Division of the Hefei National Laboratory for Physical Sciences at Microscale at the University of Science and Technology of China. The created state has the number of entangled quantum bits up to 10, breaking a world record of entangled state preparation. Meanwhile, they also utilized the Schrödinger cat state to demonstrate ultra-fine phase measurement. The result was published in Nature Physics ("Experimental demonstration of a hyper-entangled ten-qubit Schrödinger cat state"). The referees commented that this work is “an experimental tour de force”, which has “important implications for optical approaches to quantum computing and optical quantum metrology”. This project is supported by the National Natural Science Foundation of China, Chinese Academy of Sciences and the Ministry of Science and Technology. a,b, Coincidence counts obtained in the |Hright fence/|V right fence(|H?right fence/|V ?right fence) basis, accumulated for 150 s and 480 s for the six- (a) and eight-qubit (b) state respectively. c,d, Measurement showing the coherence of the cat states and phase super-resolution fringes (see text). The error bars represent one standard deviation (in c they are smaller than the dots representing the measurement points) deduced from propagated Poissonian counting statistics of the raw detection events. Quantum entanglement is the crucial “resource” for quantum information processing, which is a very competitive research topic in the quantum information field. In 2000, the National Institute of Standards and Technology (NIST, USA) demonstrated the four-ion entanglement. In 2004, the researchers from the same QPQI Division broke the record, and successfully created a five-photon entangled state. 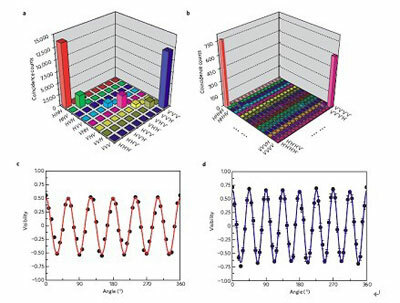 In the end of 2005, two groups from NIST and the Innsbruck University, Austria announced the demonstration of six and eight-ion entangled states respectively, and had kept the record since then. How to efficiently expand the number of entangled qubits is a great challenge in quantum information field. PAN Jianwei, CHEN Zengbing, PENG Chengzhi and coworkers aware that each degree of the freedom of a single photon can be defined as a quantum bit under suitable conditions. These different degrees of freedom can be used to form an entangled state, the so-called hyper-entangled state. This idea provides an effective method to expand the number of entangled quantum bits. Using this idea the research group realized the 10-qubit Schrödinger cat state based on a five-photon polarization entangled state and thereby demonstrated entanglement-based phase super-resolution. This work has attracted widespread attention in the international academic community. As soon as the e-print of the reported work appears on the arXiv, physicsworld.com reported the news under the title “Physicists set new entanglement record” and regarded the work as an “important breakthrough in practical quantum computer”. According to the researchers’ introduction, the concept of Schrödinger cat states comes from a well-known paradox: there is a cat inside the box which can be simultaneously dead and alive. Although a macroscopic Schrödinger cat state does not exist in the macroworld, it does exist in the microscopic quantum world. Scientists can use photons or atoms to create such a state.